Iron Man 3 marks the start of Marvel phase 2 and you will be pleased to hear that there is no hangover here following on from last years Avengers Assemble huge success. When Tony Stark’s world is torn apart by a formidable terrorist called the Mandarin, he starts an odyssey of rebuilding and retribution. Relying on his instinct, intellect and iron suit, Stark puts it all on the line as he struggles to control his personal anxieties and an enemy that knows no bounds to protect those closest to him. As April 26th gets closer and closer, the Iron Man 3 marketing machine is at it again. The new poster features both Tony Stark and Pepper Potts in the thick of it. It gives us a glimpse to suggest that Stark will do what ever it takes to protect Pepper. Just as mouth watering as the films marketing campaign is the brilliant ensemble cast as along with Downy Jr and Paltrow is Don Cheadle, Guy Pearce, Rebecca Hall, Jon Favreau and Sir Ben Kingsley. April 26th simply can’t come soon enough. 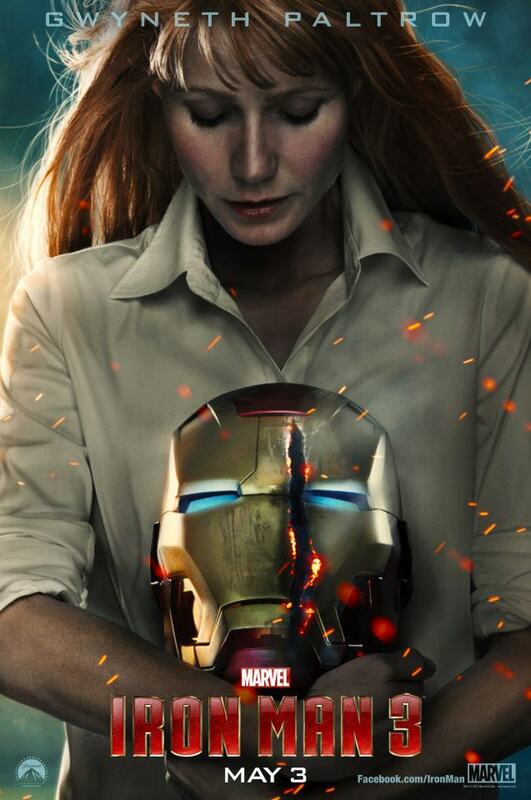 film gwyneth paltrow Iron Man Iron Man 3 movie poster robert downey jr. The new trailer for Iron Man 3 exploded into our lives yesterday and raised excitement levels to beyond anything comprehensible. Written and director by film man god, Shane Black, he looks set to take Tony Stark and his iron clad alter ego into darker new territory. With Iron Man facing a violent and brutal nemesis in the Mandarin played by Ben Kingsley there is a complete shift of tone with Tony deserting his role as the world’s hero to protect his beloved Pepper Potts played by Gwyneth Paltrow. Joined by Don Cheadle this ‘one last battle’ for Iron Man, looks like the movie is going to be on an epic scale. While the tone is darker, the villains more sinister and the action more explosive i encourage you to watch “Kiss Kiss, Bang Bang” to get an understanding of what a magical, quick witted and brilliant combination Robert Downey Jr and Shane Black can be. After watching this there is one thing left to do. Book tickets!